There’s no getting away from the fact that Romy Ash’s début novel FLOUNDERING has garnered a lot of attention on the Australian literary scene. It was shortlisted for last year’s Vogel Award (for unpublished manuscripts) and this year as a published novel appeared on the shortlists for the inaugural Stella Award, the Commonwealth Writers’ Prize and now the first-ever all-female Miles Franklin Award shortlist. So the fact that I am underwhelmed by it won’t matter a jot. Which is as it should be. Whereas last year my foray back into the literary end of the writing pool was very successful, forcing me to reconsider my “I’m done with literary fiction” stance, FLOUNDERING reminded me of all the reasons I gave up on it in the first place. It starts with a woman picking up the two sons she abandoned a year or so earlier as they walk home from school. Loretta (she won’t be called mum), Jordy (13) and Tom (11) then travel across the country in the half of the novel that is reminiscent of the classic American road trip experience, though with a distinctly Australian flavour. Although the trip has seemed directionless it turns out Loretta’s aim was to reach a run down beach side caravan her parents have probably forgotten they own. In an event that was only surprising in terms of the length of time it took to happen, Loretta disappears again and, largely due to Jordy’s fierce fear of being fostered, the boys try to fend for themselves. There is, of course, an unsavoury neighbour to contend with on top of being young boys alone in the world. I know it marks me as a literary lightweight but I want something to happen in the books that I read. Preferably several somethings, at least some of which aren’t predictable from page five. FLOUNDERING really doesn’t have much of a plot and what does exist is inevitable from the outset. There were no genuine surprises for me which made the book drag, a pretty astonishing feat given it’s only 202 pages long. This kind of meandering nothingness is what I remember most from slogging through literary fiction in the past and my tolerance for it has, if anything, shrunk as I’ve gotten older. I can appreciate some aspects of the book: the vivid sense of place, some individual moments of beautifully understated heartache and even the authentic nature of the narrator’s voice (though that came with its own problems). But I wanted a story too. More, really, than any of these other things. FLOUNDERING is told from Tom’s perspective. The innocent, naive sensibility this allows for grew thin especially as it does, by necessity, leave a lot out. I found myself more interested in the book that Ash didn’t write. This is probably wildly unfair of me but I can’t help that I found the child’s point of view very limiting. His world view is, legitimately, narrow and consists of being in a hot car, not having enough food, taking lonely beach walks and going to the toilet. His inner life really isn’t that much more compelling. I would rather, for example, have known what Loretta was thinking as she drove off on a supposedly short errand that left her children alone in a new place and without food or water for a long, hot summer’s day but instead we spent (another) day viewed from the point of view of a kid whose time was largely spent sitting on a step outside his caravan. Many reviews make particular and generally glowing mention of the fact that this book raises the issue of children at risk. It does, but only in a descriptive sense. That is it says “look, here are some children in danger” and then describes their particular version of danger for 200 pages. It doesn’t offer different perspectives on those dangers nor any insights into how they might be averted. It didn’t even touch on the vexing question of how a 13 year old has learned only bad things about the welfare/foster system in his young life. After reading the book I listened to an interview with Romy Ash in which she said she wanted to write a book with no bad guys and I’ve been pondering this for a few days. I think it probably explains a lot. Ash has been gentle with everyone, even the people you might expect to dislike and while this is admirable in a “golly let’s all be totally non-judgemental of our fellow human beings” kind of way, ultimately it led to a very passive novel. To me it was just a handful of people doing a few not very interesting things for a while. And then they stopped. There are however a gazillion glowing reviews of FLOUNDERING to be found so read a few of those before taking my word on anything. And if you do decide to read it make sure you’ve a large supply of drinking water to hand: I defy anyone to read it for long without becoming intensely thirsty. FLOUNDERING is the 8th book I’ve read as part of my participation in this year’s Australian Women Writers Challenge, though only the first that sits outside my reading comfort zone of crime fiction. 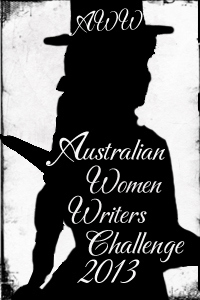 This entry was posted in Australia, book review, Romy Ash (Aus). Bookmark the permalink. Bernadette – Literary novels that focus more on place, atmosphere, etc. than on plot are not my thing either. In fact, your review reminds me – Margot’s going off-topic alert! – of a couple of books by American author Edward Abbey, who was graduated from my alma mater and therefore, whose books we were required to read. Abbey was an avid environmentalist and it wasn’t that I disagreed with him about the need to take care of the environment. But his books were exactly like this one in the sense of nothing much happening in them. It was a very, very hard slog to read them and although he gave beautiful and realistic descriptions of the desert, the forest and so on, I never saw the point. Still don’t really so many years later. I acknowledge that lots of people disagree with me but there it is. This post typifies what I admire about you as a reviewer Bernadette. I haven’t read Floundering but I salute the candor of your review. Thanks Angela…I don’t think I’d have posted this review if I’d read the book when it first came out as she is a new, young author – but with so many people clearly disagreeing with me I don’t feel so bad about voicing an opposing view – it’ll get lost in the crowd anyway. I do think carefully before posting negative/partly negative reviews which I don’t do a lot anyway because I tend to self-select books I expect to like. Whew! Another book I don’t have to had to the TBR humongous list. You have pointed out exactly why I read very little literary fiction. I want something to happen in a novel. I know there must be good novels in that area, but I have plenty of good mystery novels waiting to be read, and I don’t want to take the time to find the occasional good non-mystery. I do try science fiction and fantasy, occasionally, on my son’s advice or if I see a good review. Your review made me think. I am finding it very hard to find good new crime fiction to read. Is the field becoming overcrowded now, I wonder? So many crime fiction books that I borrow from the library that I can’t be bothered to finish reading for one reason or another; mainly because the ending is predictable or the characters are unconvincing. I seldom buy new crime fiction (Elly Griffiths being an exception) and there are still old favourites to enjoy such as Peter Lovesey (The tooth tattoo) and Simon Brett (the latest Fethering mystery) I am now reading more biography, autobiography and re reading old favourites like Josephine Tey, Agatha Christie and various other writers. I do think there is a lot of lazy crime fiction being published – but I’m still finding a lot of good stuff to read too – just have to wade through some of the bad stuff occasionally. I’m glad you wrote this, Bernadette! I thought the writing and tension were skillful, but it was a bit two-dimensional. If it was a more complex novel I think it would have warranted its awards.